At Blue Nile we offer a variety of Freshwater, South Sea, and Tahitian cultured pearls. 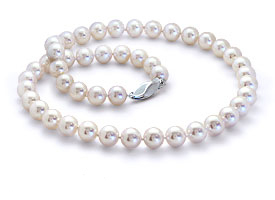 In addition, we offer two collections of Akoya cultured pearls. Our pearl jewellery is available in a variety of different styles including studs, fashion earrings, strands, necklaces, pendants and bracelets. In addition, we offer our pearls in varying price ranges so that you can find the perfect pearl for your style and budget. Pearls produce an intense, deep shine called lustre . This effect is created when light reflects off the many layers of tiny calcium carbonate crystals that compose the pearl. This substance is called nacre. When selecting a pearl, consider that the larger the pearl, the more nacre it has, so it will also exhibit even more lustre. Compare a 5mm Freshwater cultured pearl with a 10mm South Sea cultured pearl and the difference in the amount of nacre is obvious. The difference in lustre is as clearly visible as the difference in the pearl sizes. At Blue Nile, we offer the highest quality, rarest pearl shape – round. Shapes that are not spherical or even symmetrical are considered lower quality. Akoya, Tahitian, and South Sea pearls found in jewellery have a tendency to be the roundest, while Freshwater pearls can be oval or slightly off-round. As a mollusc creates a pearl, the layers of nacre do not always adhere smoothly. Sometimes spots and bubbles can appear in the layering process. Pearls with the smoothest surfaces are the highest-quality, most sought-after pearls. At Blue Nile, to offer you a range of prices, we offer pearls with a range of surface qualities. When cared for properly, pearls can last a lifetime. The best way to care for pearls is to wear them often as the body's natural oils keep pearls lustrous. However, it's important to keep them away from household chemicals including perfume, makeup and hairspray. Chemicals found in these common products can dull the lustre of your pearls. It is recommended that you put your pearls on last when getting ready and make them the first thing you take off when you come home. Before putting your pearls away, wipe them with a soft cloth and store them separate from other jewellery to avoid scratching their tender surfaces.